SpaceX's first "Block 5" Falcon 9 rocket booster stands on the launch pad at Cape Canaveral Air Force Station in Florida ahead of its second mission on Aug. 6, 2018. The same rocket will lift off a third time no earlier than Dec. 1, 2018. Update for Nov. 30: The SSO-A mission is now scheduled to launch on Sunday, Dec. 2 at 1:31 p.m. EST (1831 GMT). SpaceX has once again delayed the launch of its historic SSO-A ride-share mission, which was scheduled to launch 64 small satellites on a twice-reused Falcon 9 rocket on Wednesday (Nov. 28). 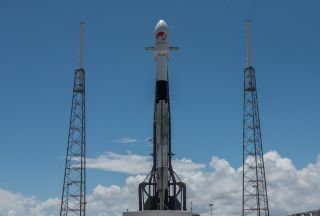 Dubbed "SSO-A: SmallSat Express," the mission was scheduled to lift off from Vandenberg Air Force Base in California on a Falcon 9 rocket at 1:31 p.m. EST (1831 GMT) before landing on a drone ship in the Pacific Ocean. If eventually successful, this would be the third launch and landing of this "Block 5" Falcon 9 rocket booster — a historic first for SpaceX's reusable rockets. SpaceX later added in a tweet that the delay was due to extreme high altitude winds, and that the company would announce a new launch date "once confirmed with the Range." This is the second time this month that the SSO-A mission has been delayed; an earlier launch attempt, on Nov. 19, was postponed "to conduct additional preflight inspections," SpaceX officials said. SpaceX has not yet issued a statement about today's delay. Not only will the SSO-A mission make history by launching and landing a reusable rocket a third time, but it will also be the largest ride-share mission to launch on a U.S. rocket, according to Spaceflight, the mission management provider. SpaceX will likely post an update on the SSO-A mission on Twitter once a new launch date is confirmed, and you can follow the 30th Space Wing on Facebook for additional weather updates and an event once a new date/time is chosen.